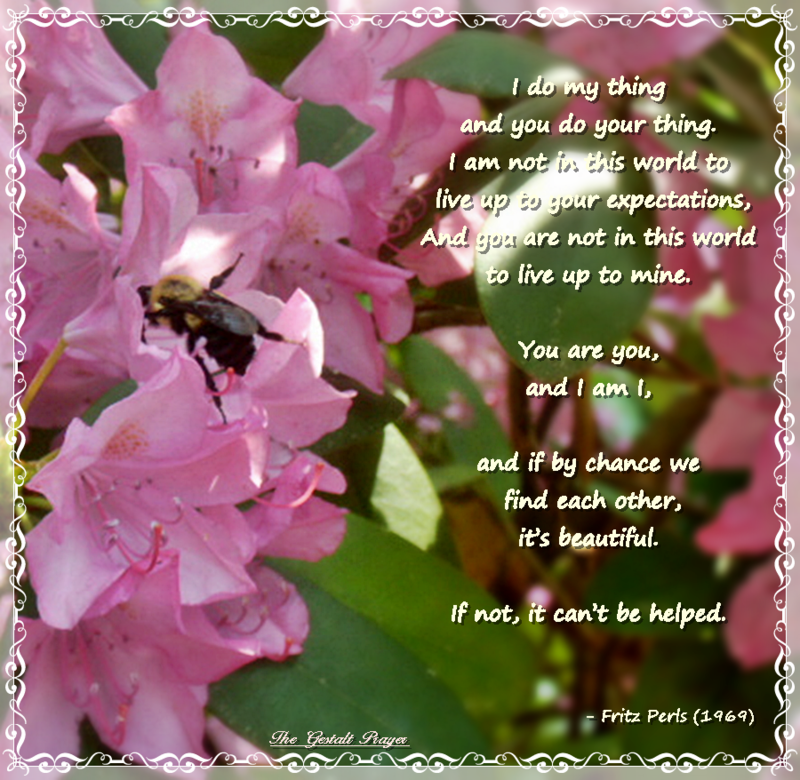 The words are a poem by Fritz Perls and they are usually titled the “Gestalt Prayer“. Its not really a prayer, other than being a statement of affirmation. The poem could have been titled the “Gestalt Mantra” or “Gestalt Chant”. What Perls wished to affirm, I believe, is the spirit of independence and relative self reliance, that… with the concepts of personal growth, sustainability and responsibility, are at the core of his Gestalt Therapy Theory. The Gestalt Prayer can be found in the work “Gestalt Therapy Verbatim” by F. Perls. The photo is mine… for some reason I like to photograph bees. I hope you find it to be a cool affirmation poster. Thanks to Fritz and Laura Perls and the rest of the “gestalts” for there inspiring words. This is the “Gestalt Prayer” stated by Fritz Perls and it is often argued as statement of independence in a persons social life. We humans are all actively, changing organized phenomenons… or “gestalts“. We, individually are in a fluid state of both independence and interdependence with our physical surroundings and people in our lives. Thus the Gestalt prayer is philosophical statement of self- autonomy in ones personal relationships. I have my own needs and goals to live up to… and not the expectations imposed on me by others, or the expectations I think others have of me. Just the same, other people do not live their lives to meet my expectations. I have never cared for the “Gestalt Prayer” as a philosophy. We are in fact expected to meet commitments we make. We make commitments to take care of children or family members. Our Governments have expectations of us that we must meet. So this “prayer” is a bit misleading or a bit to rigid. However, our own self expectations and living to our own needs are most important. So its good to say the Gestalt prayer out loud , every so often….Just to remind of us of our self autonomy.